Next weekend will mark the first anniversary of Weekly Herb Blogging, Kalyn, WHB's founder, invites us "coming" over to her Kalyn Kitchen and sharing our dishes that feature our very favorite herb, then she'll tabulate results and announce the most preferred herb! C'mon over and have some fun! Ok back to this week of WHB, I feature scallion (or spring onion called by some British) in western cooking ... psst! I'm gonna use it in a traditional Chinese snack next week. Defroze the spinach. In a large skillet, heat up some oil, fry shallots over low heat for a minute, saute spinach for a couple minutes over medium/medium-high heat, salt to taste. Scoop into a sieve, and press the spinach and drain as much water as you can. 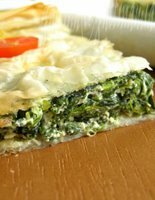 In a large mixing bowl, mix spinach, scallion, ricotta (and other cheeses if used), an egg until combine, add little milk if necessary. Salt and pepper to taste. 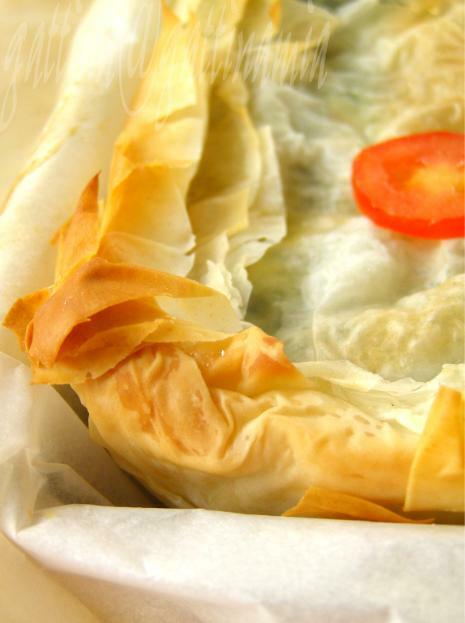 Line a 8"x12" ((20cmx30cm) baking tray, lay down six sheets of phyllo (according to the manufacturer's direction). Spread the spinach mixture, on top cover with three phyllo sheets. Fold down the sides and trim if necessary. Bake the pie in a pre-heat oven (350F) for about 30 minutes, or it turns golden brown. Ok, I'm racking my brain to think what might be a traditional Chinese snack with scallions. In Utah these are called "green onions". I love them. My mom used to eat them raw, dipped in a bit of salt. The tart sounds better to me! Looks delicious. Gattina, this looks so delicious! Nice recipe... 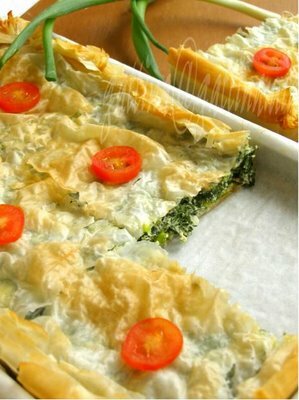 I was looking for something with phyllo... I bought it but not tried it yet! Kalyn, thanks! My friend's father (northern Chinese) likes eating green onion (and garlic) raw too. Jolene, thank you. You're working on your site, I guess? Gattina, you're into phyllo sheets nowadays :) That's a yummy pie you've got there. Oh, I love that picture!! This is the perfect thing for phyllo, always yummy! And, they are telling us that frozen spinach is safe. I was just thinking today that I should buy a few boxes of it and use that in a dish. Well, here you are with the perfect recipe! Angie, Sher, Lis and Jolene, thank you so much for all your kind words! Shaheen, if you use fresh spinach even better, but I just don't know how much you should use though.